They raised a glass in San Francisco. They networked in Detroit. They shared a laugh in Tokyo. July 14 is President Ford's centennial, and on July 11 Fordies from around the country and the globe came together in their respective cities to show school pride during the 3rd annual Worldwide Ford School Spirit Day. This year, Spirit Day gatherings were held in 11 cities—Ann Arbor, Boston, Chicago, Denver, Detroit, Lansing, New York City, San Francisco, Seattle, Tokyo, and Washington, DC—with informal get-togethers and well wishes coming in from several other locales (including Bulgaria!). Each year, the Ford School encourages Fordies to celebrate their school and honor the legacy of President Ford by attending one of the many alumni-led Spirit Day gatherings. 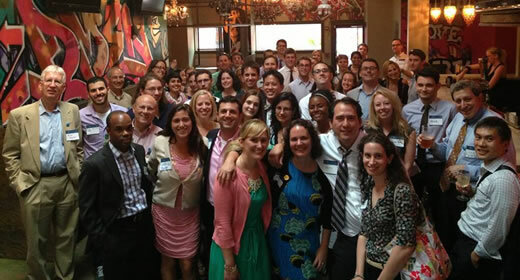 Spirit Day offers an opportunity for alumni, current and incoming Ford School students, faculty, staff, and community members to gather and catch up, network, and share the latest school news.